The Custom Leather Computer Briefcase is part of our Advenure Line which is a combination of dark brown distressed cowhide leather and 22 oz. beige canvas. The Elk River Custom Leather Computer Briefcase is a light weight construction briefcase that has a padded computer sleeve holding up to a 14" screen. 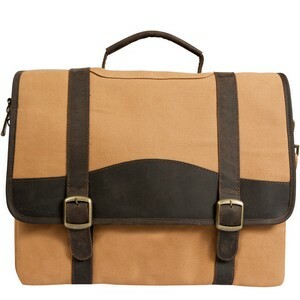 There are numerous interior and exterior pockets and organizers that finish off this bag, and give it a "sharp" look.